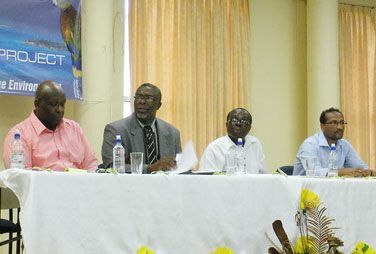 Through the Ministry of Health, Wellness and the Environment, a National Biosafety Framework project was launched last Thursday at the Methodist Church Hall. Permanent Secretary Luis deShong stated that the launch serves to educate persons about the value of biotechnology and the importance of biosafety to St Vincent, as producers and exporters of agricultural products and importers of food products. He explained that while the development of genetically modified crops offers the potential for increased agricultural productivity, which can contribute directly to enhancing human health and development, potential risk is also evident. “Whereas the conventional food crops are not usually subject to rigorous safety assessment before marketing, genetically modified foods must undergo consistent safety assessments,” the permanent secretary said. Additionally, deShong pointed out that the project seeks to safeguard human health and environmental safety, as well as initiate a knowledge base for genetically modified foods, a matter that is often met with resistance on a social scale. In his address, Minister of Health Clayton Burgin stressed that globally, there are advances being made in biotechnology, particularly agricultural biotechnology, which seeks to address food production and safety challenges. “The scientific community agrees thatâ¦the development of genetically modified organisms offers directly the potential for increased agricultural productivity,” the minister said. He pointed out that GMOs are developed to improve product quality and resist pests, using various plants, animals or viruses that can often have unfavourable results. It is for this reason that emphasis has been placed on biosafety, an integral part of a sustainable development plan. “Consideration must be given to the safe transfer, handling and use of genetically modified organisms or products which are created by modern biotechnology and which may have adverse effects,” Burgin said. Burgin expressed gratitude to the United Nations Environmental Program and the Global Environment Facility, which aided in the implementation and development of the framework. Furthermore, Burgin stated that civil society also has a role to play along with the stakeholders of the project, and urged them to become knowledgeable about biotechnology. “Your contribution towards the implementation of this project will be valued enormously,” he said. Leonard O’Garro, a Vincentian and senior international advisor of Biosafety/Biotechnology, gave a presentation on the National Biosafety Framework, highlighting several aspects of the project. Other countries involved in developing biosafety frameworks include Antigua and Barbuda,The Bahamas, Barbados, Belize Dominica, Grenada, Guyana, St Kitts and Nevis, Suriname and Trinidad and Tobago. A National Steering Committee of the National Biosafety Framework project has been formed to deal with the project for its duration. Executive director of the Bureau of Standards Ezra Ledger is chairperson of this committee. Sylvester Lynch is the project coordinator.